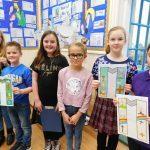 The Diocese invited all of their schools to take part in a competition to design a stole for our new bishop when he is appointed. 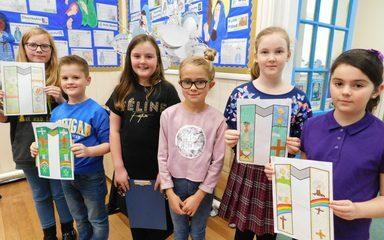 The whole school were keen to take part and the children came up with some very creative and imaginative designs incorporating lots of Christian symbolism as well as a nod to the the North East. The work of four children from each class was shortlisted by our Mini Vinnies group, who then narrowed it down to a final 4 designs. 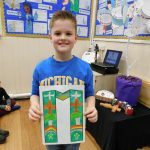 Following a vote, the eventually winner was chosen and his design will be entered into the Diocesan competition. Fingers crossed the winning design if from St Joseph’s Juniors! Below are the shortlisted designs from each class and a photograph of the winners.